A hard fought opening day, Friday 1st February, in Guaynabo, Puerto Rico at the Universal 2019 Pan America Cup; there were no shortages of surprises. Nikhil Kumar of the United States and Canada’s Alicia Cote were the names to attract the attention. Meanwhile, for the host nation, Brian Afanador flew the flag. …………Nikhil Kumar of the United States booked his main draw men’s singles place on debut; the no.15 seed, he beat Mexico’s Marcos Madrid, the no.5 seed (7-11, 11-8, 11-8, 9-11, 6-11, 14-12, 11-6), saving two match points in the sixth game. Later he overcame the Dominican Republic’s Emil Santos, the no.10 seed (11-9, 11-6, 11-5, 11-6) to reserve his main draw place. …………Canada’s Jeremy Hazin upset the order of merit. The no.16 seed, in the men’s singles he overcame Chile’s Gustavo Gomez, the no.8 seed (11-6, 11-5, 11-9, 11-7) and Puerto Rico’s Daniel Gonzalez, the no.11 seed (11-7, 11-5, 13-11, 11-4) to secure first place in his group. 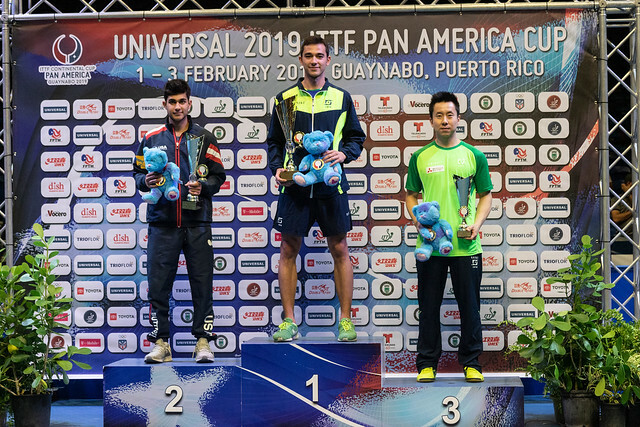 …………Puerto Rico’s Brian Afandor, the no.7 seed in the men’s singles event, topped his group as predicted; immediately Ricky Martin, with 11,700,000 followers, congratulated Brian Afandor on Instagram. …………Alice Cote from Canada was the female player of the day. The no.14 seed, she beat the host nation’s Melanie Diaz, the no.8 seed (7-11, 8-11, 11-3, 9-11, 11-5, 11-7, 11-7) and the Dominican Republic’s Eva Brito, the no.11 seed (4-11, 15-13, 11-4, 11-6, 11-5). …………Lily Zhang of the United States, the no.5 seed, alongside Brazil’s Gui Lin, the no.6 seed, topped their groups as status advised. …………Mexico’s Yadira Silva, the no.9 seed, caused an upset to end the day; she secured first place in her group by beating Chile’s Paulina Vega, the no.7 seed (7-11, 11-6, 11-13, 11-9, 10-12, 11-9, 11-5).